I have the impression that the last favorites were literally a few days ago, this month ended so quickly. Was extremely hot in England and honestly saying summer has already tired me a little and I have enough. 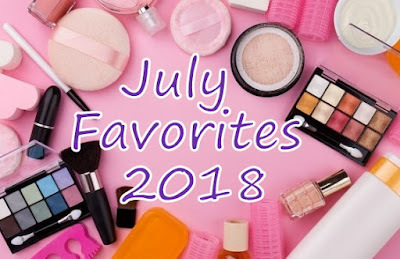 I'm not prolonging and I invite you to July favorites which certainly will not be much because I rather used old, tested cosmetics. The perfect eyeshadow if we want to achieve a spectacular effect in mega simple and quick way. There are also other shades available in the shop's offer, I highly recommend. Very good face cream with 50 Spf filter, of course will be work great not only in the summer but throughout the year. You can read more about it in a separate post. On this month I had a short trip to the family and I wondered what kind of foundation to take with me that will last many hours, will not get ugly at high temperatures and will have medium coverage in which I will feel comfortable. The choice fell on Studio Fix which will work perfectly both on holiday and after. Only what bothers me is a strong chemical smell but for this effect I can stand it. This brush was part of the Rose Golden set but you can buy also separetly. Sensationally suitable for the application of shadows to emphasize our eyebrows. According to me, it's perfectly stiff but in the feeling soft thanks to which you can easily and quickly get the desired effect. Definitely my number one to eyebrows! A shower gel that smells very nice by a strawberry, however more not like a fruit but strawberry chocolate or a cake, so pleasantly sweet. The smell stay on the body for quite a long time. Perfectly cleans the skin, making it soft and smooth. I also had chocolate version from this series, which every chocolate fan will love. This blush stole my heart from the first sight. Gives to skin a beautiful healthy look and a delicate glow. My current must have in a cosmetic bag! What are yours favorite cosmetics on this month😀💥?